I attended a baptism this past weekend and this was the gift I gave to the little guy receiving his first sacrament. I always struggle with whether or not to give a gift at a baptism. This is because, more than likely, I just gave a gift to the baby in question when he/she was born. Since I do not have an abundance of time or money, I usually opt out of the baptism gift. But then comes the guilt. So, I have a new solution: the embroidered onesie. Not too difficult, time consuming, or expensive. I don’t like the idea of giving a regular baby gift as a baptism gift. We’re at a baptism to witness and celebrate a child’s initiation into the church and I think that any gift given at such an occasion should reflect that. That’s why I came up with this design. When a child is baptised he/she becomes a “child of god”. Not very original of me, I know, but very appropriate. I think I may give one of these at every baptism I go to in the future. I love crafty gifts! 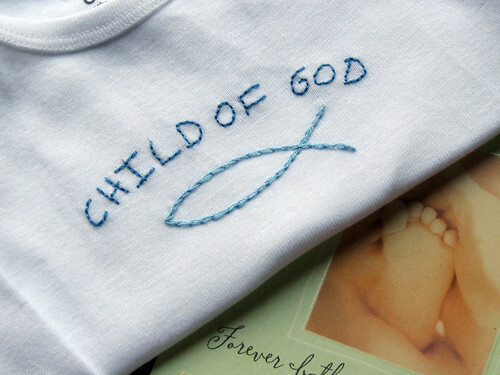 What a great idea, I think this is lovely – if I were to recieve it for my childs baptism I would be delighted. Thank you for sharing this unique baptism gift. Your gift idea will be of great help.